« Stefaan Engels Runs 365 Marathons In 365 Days! For people who’ve never clung to the side of an airy cliff, it is difficult to understand exactly how high that level is. His ascents are tests of strength, endurance and mental acuity so demanding that only a handful of the world’s most elite climbers can do what he does. Though climbing comes naturally to him, Steck also trains religiously for his climbs. He has a trainer who works with Olympic athletes and never misses a work out. As a result, Steck can do one-arm pull-ups from his fingertips and run for three hours right off the couch. On the rock he can claw his way up routes glazed with ice so steep and bare that the face can seem virtually blank. In April he and Simon Anthamatten won one of mountaineering’s prestigious Piolets d’Or, or Golden Ice Axes, for a bold new ascent up the unforgiving north face of 6,500-metre Tengkampoche in Nepal. The two were also recognized for scrapping their own expedition to try to rescue a stranger dying in the snow high on Annapurna last year. “Quite often someone who climbs at the top level is totally self absorbed,” said Norman Croucher, a double-leg amputee from Britain who has climbed 8,000-metre peaks and presented Steck and Anthamatten with an award for their bravery in April. Like many mountaineers, Steck is deliberate and quiet. He has a thin frame braided with swollen muscles. When he speaks he chooses his words like a tactician, making sure each is precise. Friends say that deliberateness is how he is able to make record-breaking climbs. Steck swears that climbing spooky sections with no rope to catch a fall can actually be safe. “Climbing the steep, exposed sections is not the dangerous part because there you are moving slowly, making sure each hold is good,” he said shortly before giving a slideshow presentation near Zurich on some of his feats. Steck did nearly die a few years ago when a rock fell on his head at 6,000 metres, sending him tumbling to a glacier below. Miraculously he walked way. “It opened my eyes,” he says. “You see how fast everything can happen. But it was important for me to understand that it was just bad luck and not that I had pushed too far. Climbing wasn’t a Steck family pastime. Ice hockey was, and Steck, the youngest child of three boys, played hard as a left defender. Though he liked the game, it did not capture him as climbing eventually would. Steck got his first shot at a summit when he was 12 years old after a friend of his father’s took him up a peak near his home in Langnau, a town of about 9,000 people in canton Bern. It was a “real alpine climb”, Steck said, with steep sections that the boy immediately led. 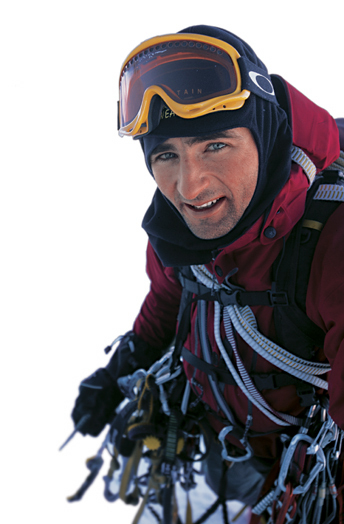 By the time he was 14, Steck was travelling around Switzerland on his own to climb. At 15 he went to Corsica where he tackled ever more difficult routes. He started spending summers in Yosemite and worked at ski areas in winter to save more money for climbing. He started landing sponsorships and for the past four years he says he’s felt like a full-time professional climber, earning as much as a craftsman might. Other climbers are often critical of speed climbers for aesthetical reasons. Reducing a mountain and all its natural beauty to a racecourse goes against the freedom of movement that so many climbers enjoy, they say. But after his first record ascent of the Eiger in 2007, followed by ascents of the Matterhorn and Grandes Jorasses between February 2008 and January 2009, Steck realised speed climbing could serve as a stepping-stone to break “new barriers” in climbing. This entry was posted on June 7, 2011, 6:42 PM and is filed under mountain/skyscraper climbing. You can follow any responses to this entry through RSS 2.0. You can leave a response, or trackback from your own site.